I swear my Easter visitors will never want to visit Highfield again. 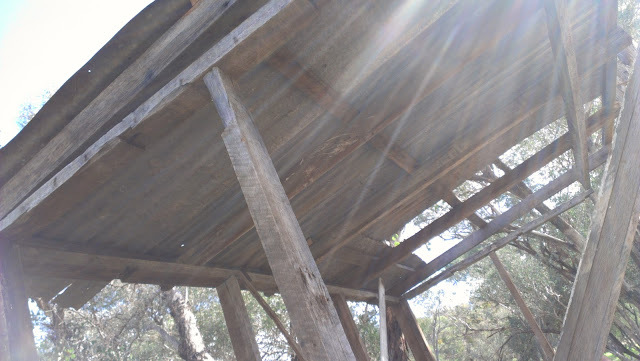 You see they were sent to the chook house, or rather sent to build a chook house, or put on catering duty to feed the workers. 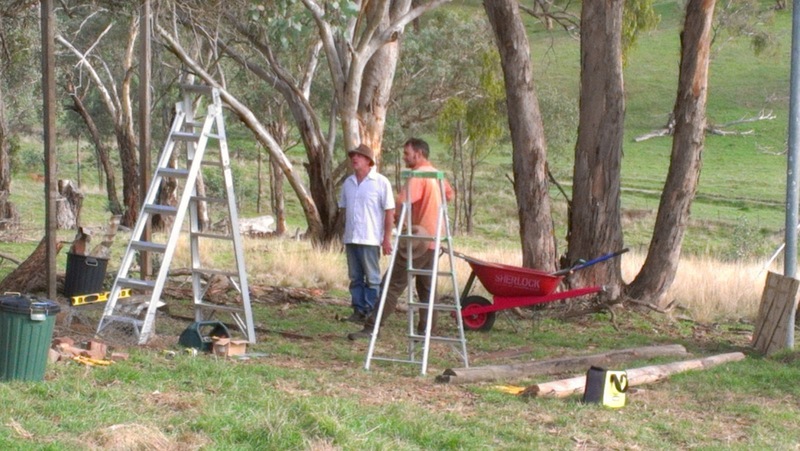 My very handy brother and the handsome Lad spent the whole of Easter and beyond on the job. 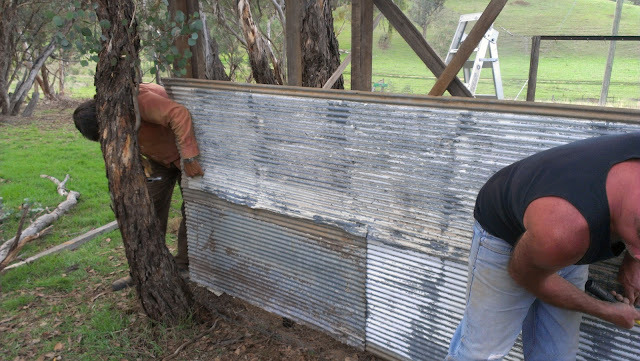 The brief was specific - build a chook house from recycled materials from the hut ruin and the farm in general (where possible) that will protect the feathery girls from foxes, snakes and goannas (very big lizards that like to eat eggs) that has good ventilation for our very hot potentially poultry-killing summers. 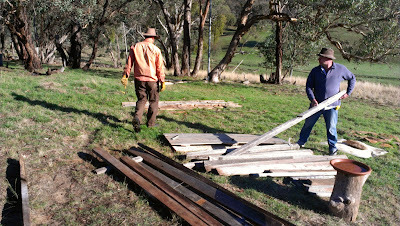 First, materials were collected from the hut and sorted. 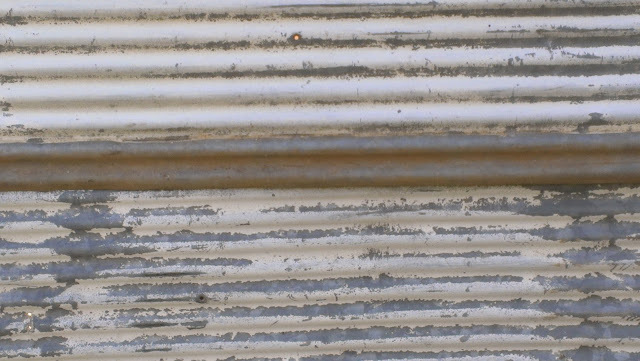 These were mostly piles of corrugated iron - the regular stuff as well as the mini orb, all with a lovely patina, piles of structural timber, old wire fencing and the odd iron bar or two. Based on the materials, the site and the brief they got to work. 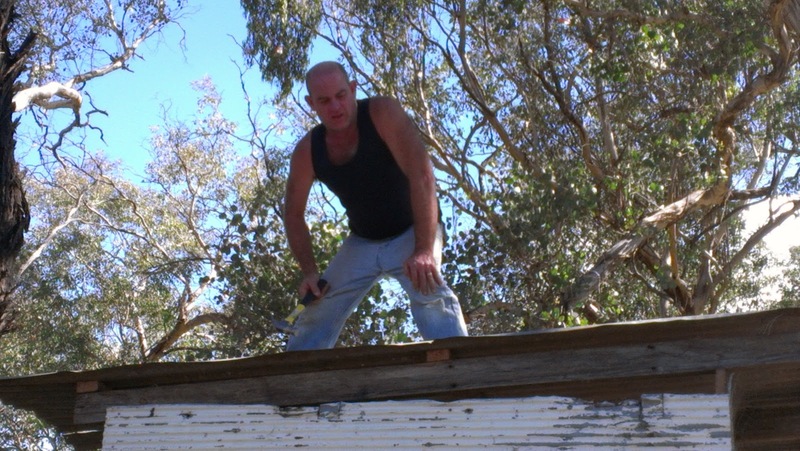 In no time at all the frame was up and part of the roof on. 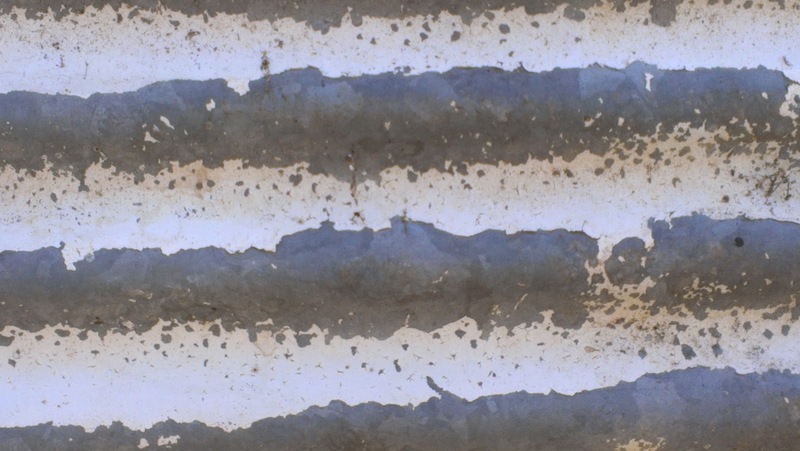 I love the patina of the materials. 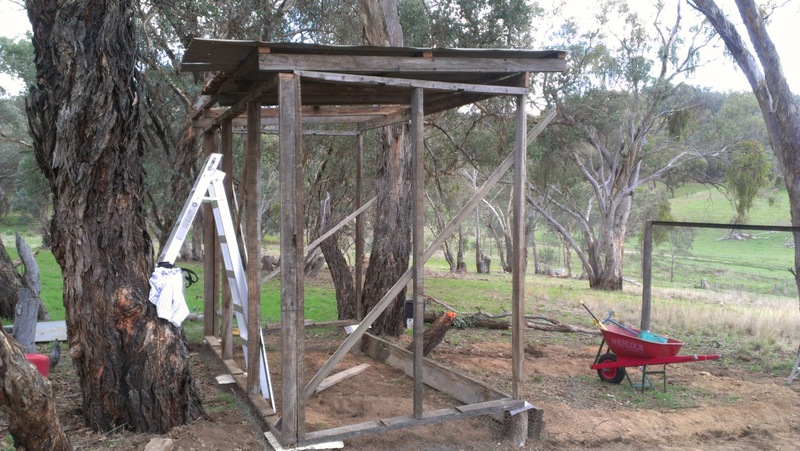 The chook house has an open fronted shed and a yard covered with shade cloth. The edges of the yard have corrugated iron dug in to stop the foxes digging under. And the sides of the house have wire mesh knitted together to stop the beasties getting in. 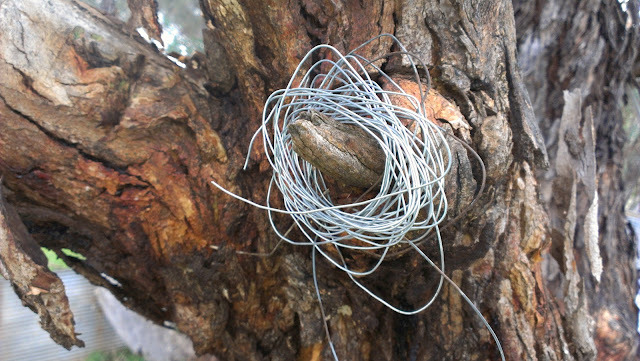 This wire mesh was old fencing material that was piled up under a tree. The only materials purchased were shade cloth, cable ties, cement, a roll of weld mesh and screws and nails. All other materials - wood , iron, door and wire fencing mesh were reused materials from the farm. Thanks so much Lads. 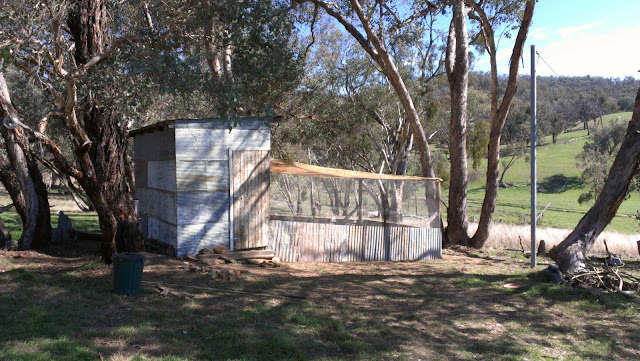 What a beautiful rustic chook house in a lovely setting. I am sure the girls will love it. And thank you chief caterer for keeping the Lads well fed and watered - stunning open sandwiches and perfect cut scones. Will you come back? I promise, no jobs next time. Next post - an introduction to the girls. 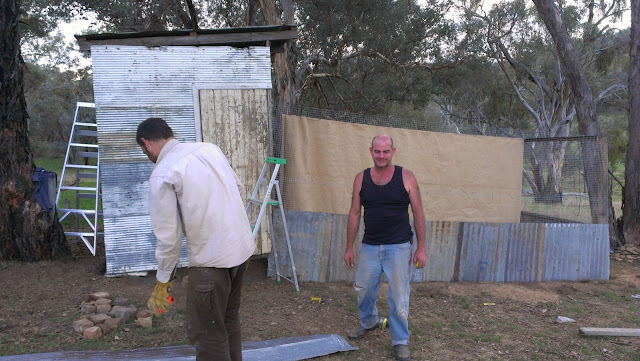 The chook house looks fantastic! Very rustic. I too love the patina. Do you hire your boys out?? I can ask them... but really, I will tell them of your chook house admiration. I am lucky! That looks like a big version of ours so of course I think it looks brilliant. 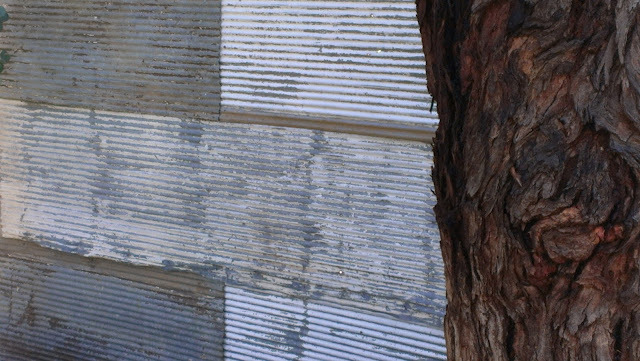 Ours is a mix of corrugated iron and in our case chicken wire. I kind of like how it looks a little like a funny too! Damn auto correct...that wad meant to be dunny. I love the fact that the girls have a view !! putting the iron into the ground to stop foxes digging in is a great idea,looking forward to meeting the girls. They also have an outdoor perch that allows them to see over the iron... I hope they like what they see. I think this is going to be chook mansion! It's going to look fantastic with all those recycled ingredients-like it's been there for ever. It's exactly how I hoped it would look, rustic but sturdy. I am very lucky. Fantastic and what a view with shade as well. Bet the lads enjoyed the beer at the end of construction. Nice job. It took days so plenty of opportunity for refreshments. Thanks for linking up with the Clever Chicks this week, I hope you'll join us again!